On May 25, 1977 in only 42 theaters, what we now know as ‘Star Wars Episode IV: A New Hope” opened. Its writer/director George Lucas was so convinced that it would not be a hit, he traded a small portion of his percentage of the movie’s profits to his friend Stephen Spielberg for an equal percentage of Spielberg’s profits from Close Encounters of the Third Kind. In spite of the fact that Spielberg’s film was successful, he definitely got the best of that deal. 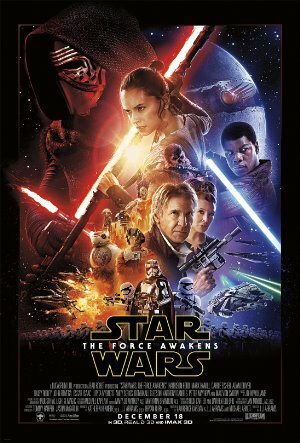 Now, the 7th entry in this franchise is in theaters (on more than 4,000 screens) and at some point in the next few weeks, it will make the Star Wars film franchise the biggest box office franchise in film history, where only one major story is involved. The Marvel “universe” has a larger total gross, but it involves film franchises that do not intersect in any way. The events in Episode VII begin roughly three decades after the end of Star Wars Episode VI: Return of the Jedi. “General Leia Organa” (Fisher) is leading the Resistance, which is struggling against The First Order, which has replaced the Empire as the evil force attempting to rule the entire galaxy. It is led by “Supreme Leader Snoke” (Serkis) who has a ruthless general named “Hux” (Gleeson) and someone very similar and yet different than “Darth Vader.” This person is “Kylo Ren” (Driver) and his mastery of the power of the Dark Side of the Force is most impressive. Both the Resistance and The First Order are searching for a map that will lead to the location of “Luke Skywalker” (Hamill), last of the Jedi. He disappeared after a catastrophe at the Jedi Academy that he’d set up following the defeat of the Galactic Empire. One of the best pilots in the Resistance, “Poe Dameron” (Isaac), has managed to obtain the map but before he is captured, he hides it in his droid, BB-8. The droid winds up in the possession of a scavenger named “Rey” (Ridley), who is marooned on Jakku. Poe is tortured by Ren but manages to escape with the help of a stormtrooper he dubs “Finn” (Boyega). Their stolen TIE fighter crashes on Jakku and this brings Finn into contact with Rey. Eventually they will encounter “Han Solo” (Ford) and “Chewbacca” and wind up delivering BB-8 to the Resistance. No more of the tremendously engaging story needs to be outlined. There are surprises, shockers and stunning sequences throughout every one of the film’s 135 minutes. In this critic’s opinion, this is by far the best film in the Franchise since the original trilogy was first released. The deft touch of director J. J. Abrams in keeping the best aspects of the first three films, especially the moments of well-placed humor, while employing advances in technology to enhance the visuals and action validates choosing him to helm this movie. I plan to see it again. Soon!